This entry was posted on December 20, 2018 by Rick. 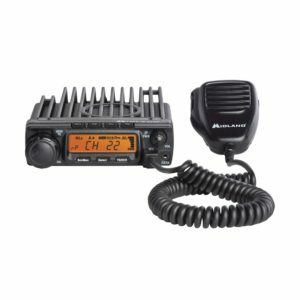 The Midland MXT400 Micromobile radio is quite popular for several reasons. It's a high wattage GMRS radio, it has NOAA weather channels, and it's mobile. One feature stands out from all the rest. This GMRS radio is also repeater capable. The support for repeater channels is important, because there are few radios around today with repeater capability that are also FCC Part 95 type accepted for the GMRS. In fact, at the time this article was published, there are only three, and all of them are manufactured by Midland. So, now you have a new Midland MXT400, and you want to connect to local GMRS repeaters. Only one question remains. How do you set up repeater channels on the Midland MXT400? It's actually quite simple and can be done very quickly, once you know how to access the repeater channels. The trick is how to find and activate them. The General Mobile Radio Service, or GMRS, consists of 30 frequencies that include 22 GMRS and 8 GMRS repeater frequencies. As a general rule, these frequencies are pre-programmed to specific channels by the manufacturer, which are standard across the industry. The frequencies on repeater channels RP15-RP22 are preset, as they are pre-assigned frequencies for all repeaters operating on the GMRS. To put it simply, they are already programmed into the the MXT400. All you need to do is activate them. Step 1. Press and hold [Menu] for 3 seconds to enter Menu Mode. Step 2. Press [Call] or [Plvl] to navigate the menu options until REP appears on the display. Step 3. Turn the Channel Knob to choose REP--ON. Step 4. Press [Select] to confirm. Step 5. Press [Scn/Mon] to exit the Repeater Channel option. Some GMRS repeaters are open, and do not require Tone Squelch (T/SQ) codes to access them. However, others do. If you need to enter CTCSS/DCS codes used by individual repeater systems, these can be easily set by assigning the specific code to each repeater channel on the MXT400. Simply go to the channel and assign the code according to the instructions in the MXT400 user manual. GMRS repeaters generally use the same CTCSS code for both RX and TX frequencies, so you should be able to assign just one code to the channel. The user manual includes a table of the CTCSS codes along with the corresponding code frequency in Hz for each. For instance, Code 12 is 100.0 Hz, so if the repeater is Output 462.6750 MHz, Input 467.6750, MHz 100.0 Hz, set code 12 into the channel RP 20 to access the repeater. You can set a different CTCSS/DCS code for each channel on the radio, including the repeater channels. Step 1. Turn the Channel Knob to the desired repeater channel. Step 2. Press [TS/DCS] once to access the CTCSS Privacy Code settings. Step 3. Turn the Channel Knob to until the desired CTCSS code appears on the display. The T/SQ icon will appear on the display to confirm your selection. Step 5. Press [Scn/Mon] to exit the Privacy Code option. Step 2. Press [TS/DCS] twice to access the DCS Privacy Code settings. Step 3. Turn the Channel Knob to until the desired DCS code appears on the display. The DCS icon will appear on the display to confirm your selection. There you have it! That's all you need to do to set up repeater channels on the Midland MXT400. For reference, a chart of GMRS repeater channels and frequencies is listed below. I have a MXT400 and handheld GTX1000 but when Try to use the same cctss or dcs code in the same channels dont work. Only when Í talk with my GTX1000 Í can hear on MXT400 but when I try to respond from MXT400 Í Cant hear on GXT1000. I dont have any Idea why if both radios are Midland. Looking for this info as well. Were you able to find a solution? I have a new MXT400 and the repeater I am trying to connect to has one code for RX D466 and another for TX D612, how do I program that into this radio. I have tried everything and can see to get it.